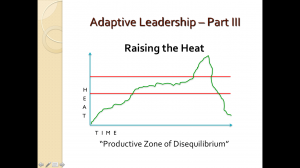 During my seventeen years of teaching in Harvard’s Kennedy School of Government Executive Education Programs, I learned a great deal about Adaptive Leadership from Professors Ron Heifetz and Marty Linsky. * I’ve written about strategies for leading change using their model several times over the life of this blog. 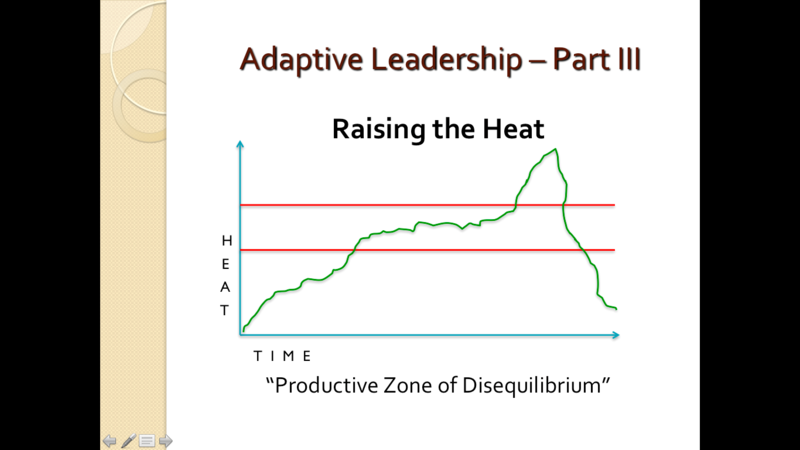 I’d like to focus here on two ideas: the difference between authority and leadership and the necessity of keeping the heat high enough to make a difference. As you read, I’d like you to be thinking about the crises looming for our country. First, the distinction between wielding authority and exercising leadership. The one who is in authority has been given a mandate to provide protection, direction and order. For example, the leader of a primate group, a silverback gorilla perhaps, knows from experience that it’s essential to climb trees to save the females, infants and juveniles from a cheetah on the hunt. He (she, if in a different primate group) knows how to protect his troupe. He also knows, from experience, where the best bananas are and where to go to avoid the winter weather. Direction. And when the young gorillas get out of hand, he can bring them back into good behavior through intimidation or coercion. Order. What happens, though, when the rules of the game change? When a poacher comes into the forest with an automatic weapon? When the traditional water holes dry up? He no longer has the expertise to exercise his authority. Which gorilla is going to lead the group to safety? Who is going to persuade its members to give up their loyalties to the old ways? What I find so refreshingly radical about this model is that the exercise of leadership can happen at any level of an organization. We don’t need to wait to become an elected official in order to help people face the inevitable loss when change is imminent. Leading is an act, not a position. In fact, being the person in authority is often a constraint to actually being able to lead. We saw this at work in our country during the 1960’s. President Lyndon Johnson knew that the Voting Rights Act was an essential step forward for the whole country. Yet, due to his position as POTUS, he was limited in what he could do to get the American citizens to face the gap between what they espoused as values and what they actually allowed to exist. Dr. Martin Luther King, Jr., however, had no official authority in the government’s structure, although he did have authority over his congregation. His ability as someone outside the mainstream hierarchy allowed him the freedom to exercise leadership. Through his speaking, activation, inspiration, and challenge, he provoked the incidents that shone a light on the egregious nature of discrimination in the South. We see it again as we face the terrifying combination of white supremacy, lawlessness, and greed in our elected president’s platform and personnel. Independent presidential candidate Jill Stein has no formal authority. Yet she has been exercising true leadership in her push to force ballot recounts in Wisconsin, Michigan, and Pennsylvania. She is willing to take this all the way to the Supreme Court. The people in authority — the DNC, President Obama, the Clinton campaign — are constrained by their position. They cannot act without public consequence, but Stein can. At some point, the heat might get too high. When a cohort of U.S. armed services veterans arrived at Standing Rock to protect peaceful resisters from the brutality of the Dakota Access Pipeline’s henchmen, it was no coincidence that almost immediately the Army Corps of Engineers halted the construction of the pipeline through sacred lands. As a result, the heat dropped below what is called the “Productive Zone of Disequlibrium.” The sigh of relief that many felt is dangerous. What this drop in heat really means is that it’s time to reinvigorate the pressure until these lands are fully, finally, and legally secured, long held treaties honored, and Native American rights protected, both in North Dakota and throughout the United States. And, if we look at the even bigger picture, halt our damaging dependence on fossil fuels. It’s easy at the beginning to be passionate about the change we want to see. I’m keeping abreast of the petitions, phone calls, e-mails, donations, articles (including this one), that are driving the resistance to the upcoming debacle of a Trump-led country. Every time someone posts an opportunity to sign, it’s an act of leadership. Every time you put your name on a petition, it’s an act of leadership. Every time we make a call or write an e-mail, it’s an act of leadership. We need to keep the heat high enough so that it stays in that productive zone until change happens. It must be constant. I ask that each of you think of yourself as exercising leadership on a daily basis. Stay informed through reputable sources. Donate money to the organizations that can protect our constitutional rights. Sign petitions that mean something to you. Make the phone calls, send the e-mails. Boycott products. Divest from banks. Stand with our Muslim friends. Fly a rainbow flag. March against hate. This cannot stop on Jan. 20, 2017. Or even on Jan. 21, 2017, when thousands of informed and passionate protesters march in major cities all over the county. We may all feel pride at rallying so many people to stand against this new administration, but we can’t let one day’s mobilization feel like victory. We must keep the heat on until the citizens of our country join in an understanding that an administration built on hate, divisiveness, supremacy, misogyny, homophobia, and unabashed kleptocracy cannot, must not, ruin our country. This may take years. It may take a lifetime. And it will be worth it. *Heifetz, Ronald, and Marty Linsky, LEADERSHIP ON THE LINE (Boston: Harvard Business School Press, 2002).